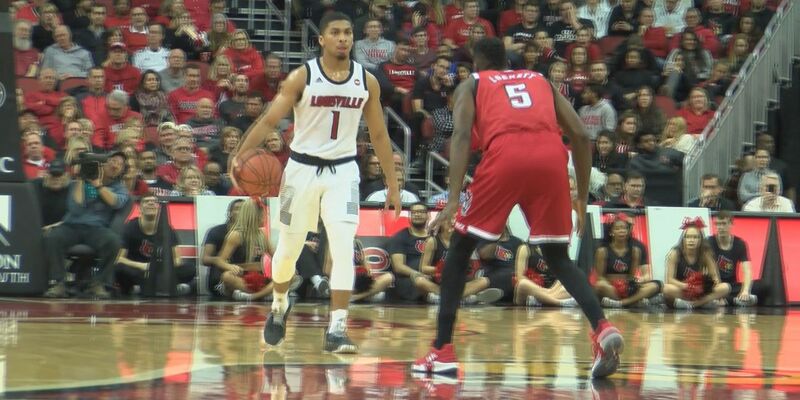 LOUISVILLE, KY (WAVE) - Christen Cunningham lead four UofL players in double figures with 17 as the #23 Cards beat #21 NC State 84-77 on Thursday night in the KFC Yum! Center. The Wolfpack hit 12-27 three-pointers and erased all of a 10 point deficit in the second half. Up one with just under six minutes to play, Cunningham got a steal and found Dwayne Sutton for an open three. Sutton had 10 points. The triple put the Cards up 70-66. A CJ Bryce three got the Pack back within one, but the Cards had an answer. Working a high pick and roll with Cunningham, Steven Enoch popped out and drained the three. Enoch had 10 points and four rebounds off the UofL bench. Still just a one point game with less than a minute to play, when Ryan McMahon stepped in front of a driving Braxton Beverly to draw a charge. McMahon was then fouled by Beverly on the inbounds play and hit both free throws. UofL was 24-29 from the line. NC State head coach Kevin Keatts, a former UofL assistant, said the crowd of 16,322 was a factor. NC State finished the game with 23 turnovers. They fall to 15-4, 3-3 in the ACC. UofL improves to 14-5, 5-1 in the league. That one loss came in overtime at Pittsburgh. The Panthers (12-7, 2-4) visit the KFC Yum! Center on Saturday at 2 p.m.